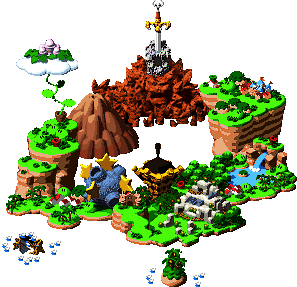 Booster Tower is a tower belonging to Booster and his Snifits in Super Mario RPG: Legend of the Seven Stars. When Princess Toadstool falls here from the sky, Booster wants to marry her, but Mario saves her. The building itself is filled with many dangerous traps and wacky enemies. However, the music is soothing, but a second heavy metal-like theme is played as the tower is further explored. Booster is often seen riding a miniature train throughout the tower. At the entrance of the tower, Mario meets Bowser. With no troops left, he declares Mario, Mallow and Geno members of the Koopa Troop, thus joining Mario's party. The tower is also the home to Knife Guy and Grate Guy. Mario, Mallow and Geno discover that a girl has fallen into Booster Tower. Arriving at the tower, they find Bowser gawking at the tower's entrance. By coincidence, Princess Toadstool hears the commotion from high above, confirming that she is the one being held at Booster Tower. With no more members of the Koopa Troop, Bowser then joins Mario and friends, claiming that he is recruiting them. Then they go into Booster Tower, fighting through the enemies until they get to the top floor, where Toadstool is held. Booster then comes in the same room, looking for a doll, so Mario must hide behind the curtains, which is being opened by Booster's Snifit minions (avoiding the Snifits completely or getting caught three times does not actually affect the plot). Booster then goes off to retrieve Toadstool and heads to Marrymore. Mario, Mallow, Geno and Bowser attempt to follow him, but they are distracted by Knife Guy and Grate Guy. After fighting them, Mario gives chase to Booster all the way to Marrymore. In the first room of the tower, there is a row of paintings. Later on, there is another row of paintings, where the player has to select them in the order they are found in the first room. Doing this unlocks a door, where the player gets one of Bowser's weapons, the Chomp. Before fighting Knife Guy and Grate Guy, the player can play a minigame where Booster has his three Snifits check a row of curtains, which Mario is behind. Mario gets three chances. If the player is caught by a Snifit three times, they have to fight Booster. If the player successfully passes the minigame, they get an Amulet. Outside Booster Tower is relatively small with a sign that reads "Welcome" with small Japanese letters that translate to English as "Bukki," which is Booster's Japanese name. At the top of Booster Tower there is a balcony. While Toadstool is trapped up there, Booster uses magic to seal the door closed. 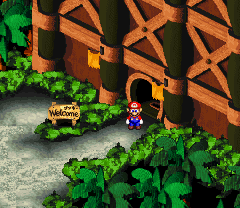 The only way the door can be opened is by saying the password, which only Booster knows; it is eventually revealed to be whatever name the player used for their file. As expected from the view of outside, the inside of Booster Tower is huge, with many rooms and floors. The floors are a checkered bronze and black. In the upper level of the first room there are photos of the seven generations of Boosters. The inside is also full of Spookums, Bob-ombs, and Chomps. There is also a female Chomp that was locked up for biting Booster. Bowser tames this Chomp and uses her as a weapon for battle. There are many hidden treasures located inside Booster Tower, including many coins and Frog Coins and an item called the Goodie Bag, which when used during battle, adds more coins to the player's total after winning the battle, and can also be sold for 555 coins. There is also a new hammer for Mario called the Masher. In one room there are two curtains and a pillar. Going behind the curtain will briefly turn Mario into 8-bit Mario; however, it can only be performed once. When about to exit the room, Mario will react in shock, shrink down to regular Mario, and run back to the curtain. He then exits the curtain to the game over theme, looks down, and then shakes his head as if trying to dispel a hallucination. This page was last edited on March 6, 2019, at 10:30.